Horse hay feeder from Hay Hut – A great horse round bale feeder! Barn World now carries the Hay Hut hay feeder! As the entire country is affected by the drought, the cost of feeding your livestock continues to rise. It’s now more important then ever to minimize waste from feeding. Barn World carries a large selection of hay feeders to minimize waste and provide increase profits. The Hay Hut hay feeder is a great horse hay feeder that is so easy to use and simple in design that feeding round bales to your animals is a cinch. In addition to the actual hay/cost savings, the use of large bale hay significantly reduces Labor costs and these Hayhuts help to minimise pasture stress in overstock situations and during poor forage growing conditions. It is interesting to note how well these units stop ‘big bale bickering’ and also how they bring a strong air of calmness and contentedness across the ranch as the horses all know that they have a constant source of forage. The Hayhut is a robust, durable, and UV stabilized covered hay feeder made of polyethylene and hence it cannot rust and does not require any maintenance unlike the majority of metal feeders. The Hayhut is a full 84 inches in depth so that it can accommodate the largest of round rolls now being produced in the USA and up to twenty conventional square bales or the majority of big square bales. This additional depth also allows it to be easily pushed back over very large bales, even if they have been placed on a pallet, without catching the top lip of the feeder on the bale. It is 84 inches high so that there is plenty of headroom for the use of a pallet while still allowing for good airflow and cooling over the top of the bale. Hayhut will fit in the back of pickup. The width of 72 inches allows up to three units (in six halves) to be transported easily in a standard bed pick-up truck (see photo). This half unit measures 42″ x 72″ x 84″ and has four feeding windows. The unit ships in two halves with simple build instructions and takes approximately 30 minutes to bolt together. They are very easy to move, manage, load and maintain and we have many testimonials to that effect. The Hayhut is supplied with all assembly hardware and a lifting eye for relocation purposes. It can also be relocated with a round roll by inserting the roll inside the unit. Just see our video to see how easy it is to move. Hayhuts are warranted for 1 year. Similar units of identical material from the same manufacturer have been examined after 6 years of 24/7 use in Missouri and this leads us to believe that Hayhuts should provide at least 10 years of good service which is an outstanding return on investment.They are designed and manufactured to accommodate all sizes of round rolls up to 1600 lbs. We have incorporated bigger windows for larger horses up to 17hh and anchor points for windy conditions. Below are just some of the happy customers we have using Hayhuts. Please contact us for more information or if you wish to provide a testimonial about how Hayhut hay feeders work for you. 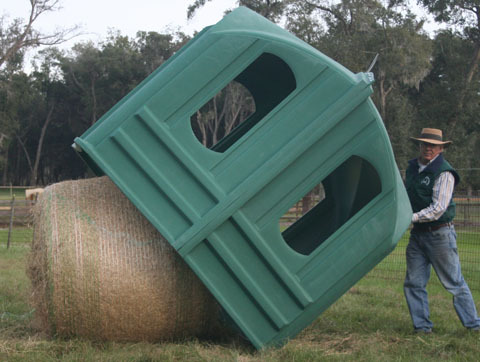 We purchased 2 Hay Huts at an equine event in Ocala, FL. They are easy to set up and use. As soon as we had them in the field the horses came over to check it out. They were eating out of it before we left. We had a really bad rainstorm about 3 days after we started using our Hay Huts. I went out after the storm to check the hay inside the huts. The hay was bone dry! The wind did not even blow rain in the windows. The horses love it and none of them fight. There is no manure or urine in the hay because the Hay Hut prevents this. This results in almost all of the hay in the Hay Hut is being used as food rather than bedding. Thank you Hay Hut for a great product that saves time and money. We plan on purchasing another Hay Hut before next winter. for your courtesy and help as I decided whether or not to buy your Hayhuts product, for Potomac Glen Riding School . Since we have four paddocks at Potomac Glen, each containing 5 to 7 horses, we needed at least four Hayhuts, and I was initially very concerned about what I thought might be an expensive investment. to report that the four Hayhuts I purchased have exceeded my wildest hopes of better hay usage & economy. Without a doubt, the Hayhuts have halved my round bale usage in just the last few months, thereby cutting my hay costs substantially. The Hayhuts have eliminated hay waste by keeping the horses from sleeping & defecating on the round bale hay. They also keep the ice, snow and rain off the round bales so I no longer lose a lot of hay. The Hayhuts have also eliminated the typical wasted mound of unusable hay, and the horses eat all of the round bale hay and leave only dust. My quality if life has improved because, in addition to saving on my round bale hay costs, I have also cut my work load substantially by feeding the bales to my horses only once a week, instead of two times a week, and the paddock clean up is virtually non-existent! Thank you again for your Hayhuts. When finances permit, I will be adding two more Hayhuts to the riding school. I will be happy to talk to anyone who is interested in Hayhuts. They can contact me at (301)601-0622, or our website is www.potomacglenridingschool.com. I will be happy to tell them about my experiences and to heartily recommend Hayhuts! Susan Hansen Potomac Glen Riding School 24201 Clarksburg Road Clarksburg , MD 20871 2. Just a note to tell you I don’t think you were totally truthful with me when we talked about the hay hut: you said I could probably reduce hay waste by about 30%… well I have now fed two round bales out of the hut and am COMPLETELY CONVINCED waste is almost totally non existent! I watch the horses eat every day at some time or other and it seems when they do drag a mouthful out of the hut and drop it, that before they stick their heads back in they almost always pick up what they have dropped and eat it first. If there is a mouthful laying on the ground when they first walk up to the hut they usually pick it up and eat it first! They have developed really good “table” manners. I would bet out of the two bales fed so far, not even three (YES 3!) pounds of hay has been wasted and when it has snowed it was totally protected. The price initially, did seem high but with the price of hay it will pay for itself in very short order, well worth the investment for sure! Thanks for delivering and helping me get started assembling it and Thanks for a GREAT product! The Hay Hut is really working out well! We wanted to drop you a note and let you know how satisfied we are with your product. We purchased three units from you in July ’09. The units were assembled and put in the pastures once we received them. We started feeding hay on and off from October until December. Starting in December we began feeding fulltime from the feeders. Our hay usage has shown a dramatic decrease. We do not see the large hay/manure piles that we routinely had using conventional round bale feeders. By this time each winter I am usually looking for sources of hay; our barn still has enough to last us for another two months. We have the largest number of horses that we ever have had on the farm, we have used less hay than we used to with fewer animals. We have fed small square bales, large round bales and large square bales in the feeders: they handle all of these varieties without any problems at all. We are feeding animals in a variety of sizes and breeds. They all readily use the feeders without any problems. We are feeding our foals, yearlings, broodmares, miniature donkeys and a large Thoroughbred and Irish Sport horse on these feeders. We have three pastures running at the present time, one feeder has five horses on it, one has ten broodmares and the other has six geldings and two donkeys. Assembly of the units was easy and took only around 20 minutes per hut. The green color blends in well with our fields and makes the huts easy to find in snow drifts, lol. Ordering and delivery were easy and I believe we will easily recover the cost of the units by the end of this year or the beginning of next. The amount of hay saved and a decrease in wasted hay/manure mixed is unbelievable. We would highly recommend your product to anyone feeding horses round bales of hay or even small bales. The quality of the huts, the cost, the performance and your customer service have made purchasing and using these units a pleasure. Hi Denis, Just thought I’d let you know the Hayhuts made it through their first Nebraska blizzard just fine! I thought I may find them either full of snow or blown across my feeding area, but, neither was the case. They stayed in place, no snow was inside and the horses had plenty to eat all through the storm! – Mary Anne G. – Nebraska From using one round bale every 3-3 1/2 days to every 5-5 1/2 days I have been using the amazing Hayhuts for not quite a year now. I was about done with round bales before I found these. The horses would waste so much. We had one paddock where we were feeding 1 round bale every 3 to 3 1/2 days. When we started using the Hayhut it went to 5, 5 1/2 days sometimes even 6 days. I am now using 1/2 a Hayhut in a shed and another on the fence line. We throw small square bales or flakes of hay. There is no waste doing that. When you feed alfalfa to the babies they do not stand on it any more. They love their hay hut. If you ever use one you will not let it go. What a great invention. Be sure to feed smart this summer and receive the economical benefits and ease of use the Horse Hut Hay Feeder offers. Also visit Barn World today for all of your livestock supplies needs. We also carry a large selection of cattle guards, hay feeders, grain bins and even 5 Star saddle pads. The possible reason that there are available lots of f horse feeders for foodstuff (hay) is that they all strive to resolve some common problems; animal wounding, major clean ups around feeders, spoilage and being waste. Waste of foodstuff from horse feeders surely has to be considered as foremost concern from the cost viewpoint. Nobody is fond of spending for quality foodstuff and most people always try to find all the waste made by the horse themselves or by the weather. Nobody gives much time, giving the right quantity of foodstuff to eat for the horses who are starving for to remove waste. Wastage from the horses themselves is sting due to the nature and quantity of the wastage in that it gets trodden and that has to be cleaned-up again and again in region of horse feeders. In so far as wounding runs from feeders, it is very aching and traumatic to witness a horse trapped in a feeder and one definitely wants to omit that possibility. Horse feeders must be simple to handle, light-weighted and preservation free, almost durable and should add to a healthier societal behavior of the horses in the area of the feeder. A hay hopper round bale feeder aids one to save money by eradicating waste made by horses themselves. If one is at present making use of a round feeder then he might be dropping 10% of his hay. If the cost of hay is $100 / ton and one feeds 2,000Ibs each day one might be dropping $300 each month or $10 each day and upto $3,600 each year in just hay. The cost of this horse feeder will be just about $150 – $250 each to send to the neighboring 48 states. It comes in the size of 1 5/8” x 16 gauge and with closed bottom. There is a steel shield which is joined to frame and able to hold loose silage and hay. It has slant bars, 15 feed openings and prairie gold powder finish coat. It is 8’dm at the bottom, which tapers to 6’7” at the top and aids to less silage waste. This exclusive design lets bale be held straight while it is fed. It has 48” height and available with 210lbs weight, and 2’ frame, 1 5/8” slant bars as well. A feed bunk is a strong steel frame and has electro animated metal hopper which is placed for hard use. It converts to horse feeder within few minutes with elective hay rack. The dimensions of the feed bunks are 10’x2’x26’ and it also allows eliminating waste. 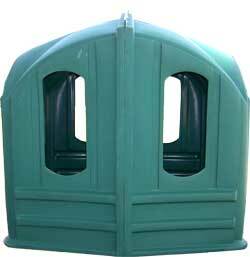 It helps omitting waste as it comes in clogged bottom silage feeder with the Cone feeder slot in. Hay Max would operate with greatest use of value baled hay in square or round. This unique design even offers for feeding evenly. The Bale is usually suspended in the cone to omit ground contact. It is reliable, sturdy and solid construction that offers longevity of use and comes in 7’-7” square. It is 1 ½ 14ga square tubing rings and 48” tall, and red oxide primer finish as well. It comes in various sizes such as 4’x6’ horse combination, 6’x6’ horse combination and 8’x6’ horse combination. It is 6’ tall and 45” wide and 16ga double V steel trench as well as 1” 16ga round tubing hay frame. A horse hay feeder has close bottom and has 8’ diameter feeds for any type of hay which comes in loose or baled that fits most of the bale sizes small or large, square or round. The corners of horse hay feeder are 9”x20” rounded and all downy frames shelter horses’ manes and necks. Horse Round Bale Feeder is a 1” 16ga2 tubing rings and 1” 16ga round tubing scaffolds. It has green enamel finish. Similarly there are many other horse feeders such as O’Neill Bale Feeder, Open Bottom Hay Feeder, Optional Hay Rack and many more available that enable to eliminate waste. All the horse feeders which are available in the marketplace, many of them are of quite good quality but are not able to solve all the problems related to hay feeding. Many of them are not weather confined, nor put off spoilage and waste. However, few of them are very heavy duty and can not be moved easily. Some need oxidation and preservation otherwise they get to be hazardous. As all horse feeders tend to resolve the same troubles and all do not fairly achieve something, there is a requirement for a entirely new idea, a new vision for horse feeders.